Made in Newcastle, New South Wales, Australia, 1983. This collection of Richard Tippings street signs relate to the city landscape, advertising and the urban environment. Manipulated road sign from the 'Roadsigned series'. It is a rectangular sign with black writing on yellow background stating 'HOLD UP AHEAD'. 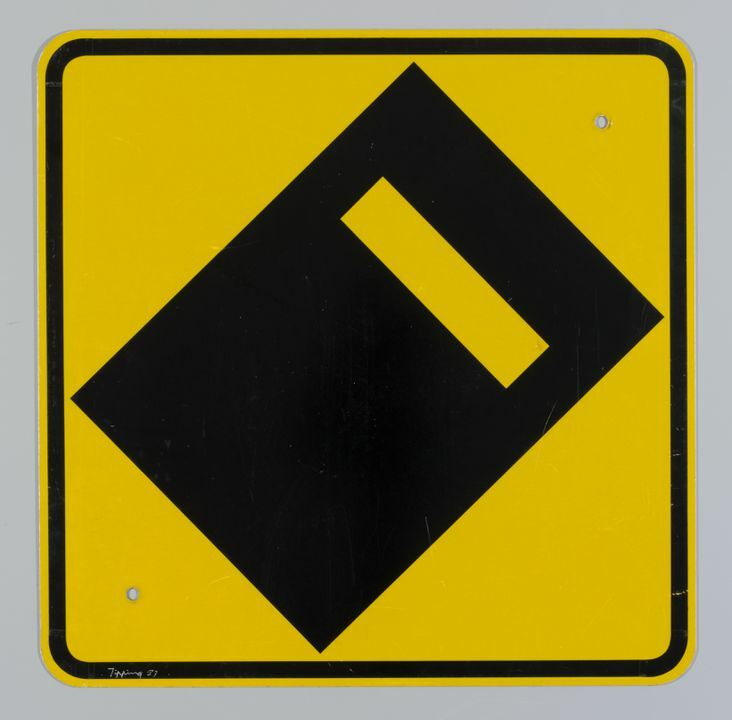 It is combined with a square yellow sign with the graphic of a 'Ned Kelly' style helmet in black that adds new meaning to this road safety sign. Both objects are signed on the reverse 'Richard Tipping, 1983, 'HOLD UP AHEAD' (pair). Example 2 of edition of 10'. Both objects are signed by the author on the reverse. 'Richard Tipping, 1983 - 'HOLD UP AHEAD', (pair). Example 2 of edition of 10'. Richard Tipping's work (prints or multiples or sculptures) is represented in the National Gallery and National Library, Canberra, state art galleries and university libraries in Australia. Internationally he is represented in the State University of New York at Buffalo, The Ruth and Marvin Sackner Archive of Visual Concrete Poetry, Miami, The Govett-Brewster Art Gallery, Plymouth, New Zealand. Manufactured by a Newcastle company 'Broadly Signs' using standard road sign measurements and materials. Australian roadsigns use an international standard design. Written on verso 'Richard Tipping, 1983. Hold up a Head pair Example 2 of edition of 10'. Editions of this sign have been exhibited in art galleries in Sydney, Melbourne, Chicago and London. It was shown in the 3rd Sculpture Biennale in Melbourne.